"When you give to poor people, don't announce that you are giving. Don't do like the hypocrites do. They blow trumpets before they give so that people will see them. They do that in the synagogues and on the streets. They want other people to give honor to them. I tell you the truth. Those hypocrites already have their full reward. So when you give to poor people, give very secretly. Don't let any person know what you are doing. Your giving should be done in secret. Your Father can see the things that are done in secret. And he will reward you." Giving to the needy has always been a hallmark of God's people. But the goal of helping others is to bring honor to the name of the Lord, not to develop a name for ourselves. We are to let our light shine so God is glorified, not us. We are blessed with what we have because God wants us to share with those in need. We are here to be conduits of his blessings. Our sharing should be such an everyday part of life that we don't even think about it, much less think about others noticing that we did it. 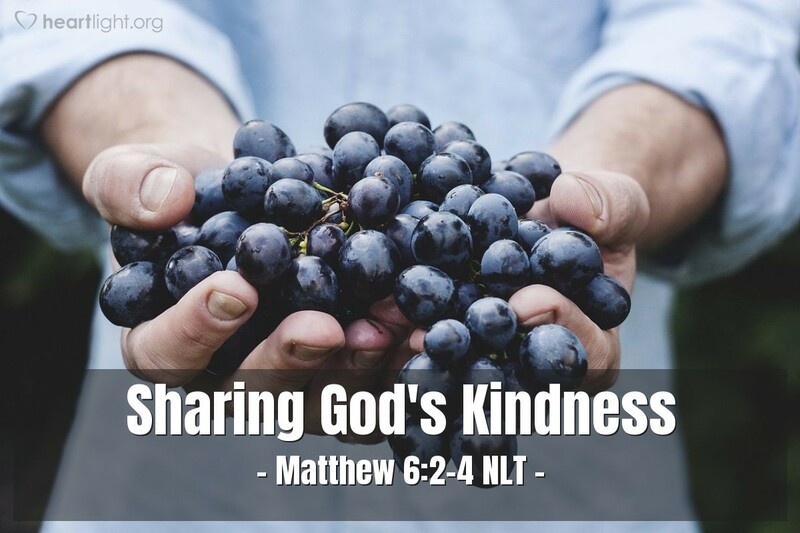 While it is not our motivation for caring, it is comforting that God will not forget our deeds of kindness or the love we've shown to those less fortunate. Holy and giving God, you are so generous with us, your children. Father, please help us and especially please stir me to be more generous with those in need. I confess that I find it easy to be cynical, at times, with those in need. But after getting to know them, their story, and their hurt, I know they need your love and blessings as much as I do. Father, I also know that you have put me here to share with them. So, dear Lord, please make me an instrument of your grace and teach me to share what you have given me. In Jesus' name I pray. Amen.